This information is provided on behalf of UL, the Door and Access Systems Manufacturer’s Association (DASMA), the International Door Association (IDA), and the following garage door opener manufacturers: Chamberlain®, Guardian Access and Door Hardware, The Genie Company, LiftMaster®, The Overhead Door Corporation, Raynor and Sommer.Recently the industry has become aware of some local news reports and social media posts relating to home owners being advised to use a zip tie to secure the manual (emergency) release latch present on automatic garage door openers. The manual release feature, often referred to as the emergency release, is REQUIRED to be operable in all residential garage door operators certified to UL 325, the American National Standard for Garage Door Operators. The manual release is also required by the Consumer Product Safety Commission (CPSC) per the Code of Federal regulations (16 CFR Part 1211) and as such is required by Federal Law for all residential garage door operators sold in the U.S. This manual release is the method to release the door in the event of an entrapment situation. If somebody or something is caught under a door that is moving downward, and for some reason the door does not reverse properly, the emergency release can be used to disconnect the door from the operator, thus removing the operator from putting downward pressure on the door. This release mechanism is tested and required to be able to be released with 50 lbs. of force or less. Interfering with this by placing a zip tie to “lock” this mechanism, basically removes this safety feature from the door operator system, putting homeowners and others at risk that this safety function may not work when needed.The manual release can also be used during power outages or other times when the operator may stop working. With the release, the door can be disconnected from the operator, providing access in and out of the garage by manually opening and closing the door. 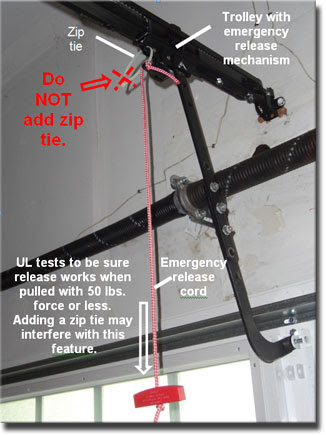 Some of the reports recommend the addition of the zip tie to avoid garage break-ins where the manual release is reported as a manner to gain entry. Those reports leave out the important safety function that may be disabled by doing so. Increasing awareness of residential break-ins benefits the public, as does providing information so they can take appropriate actions to improve their home safety and security. At the same time, it is important that such safety advice does not inadvertently compromise or jeopardize their safety in other ways. While the safety of the garage door operator is critically important, the physical and electronic security around the home is also an important consideration. The best security plans involve multiple layers of protection (high quality locks, adequate doors, intrusion alarm systems, etc.) based on individual protection needs. The following tips are provided for homeowners and the public to enhance the security of their home while helping to ensure the safe operation of their garage door system in the process. Test your door operator monthly to ensure it reverses off a 1-1/2 inch high object (or 2 x 4 laid flat). In the event the door does not reverse upon contact, adjust, repair, or replace the operator. The garage door safety label inside your garage and your garage door operator instructions provide additional guidance. Keep your garage door properly balanced, and in proper mechanical working order. An improperly balanced door increases the risk of severe injury or death. 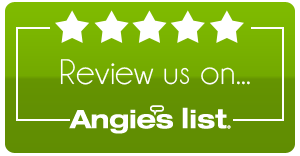 Have a qualified service person make repairs to cables, spring assemblies, and other hardware. When using the emergency release, when possible, use the emergency release when the door is closed. Use caution when using this release with the door open. Weak or broken springs are capable of increasing the rate of door closure and increasing the risk of severe injury or death.